I grew up in Indonesia where American football, hockey and baseball are not watched much, and basketball is just now breaking ground. Soccer? Now that’s a different story. There are a number of leagues that compete around the country, and of course there’s our International team. While we never really ranked on the global scene I can say that people there (including my dad and uncle) are quite passionate and even fanatical about the sport. My husband who was born and raised in the US is an all-around sports fan and gets riled up for World Cup soccer. 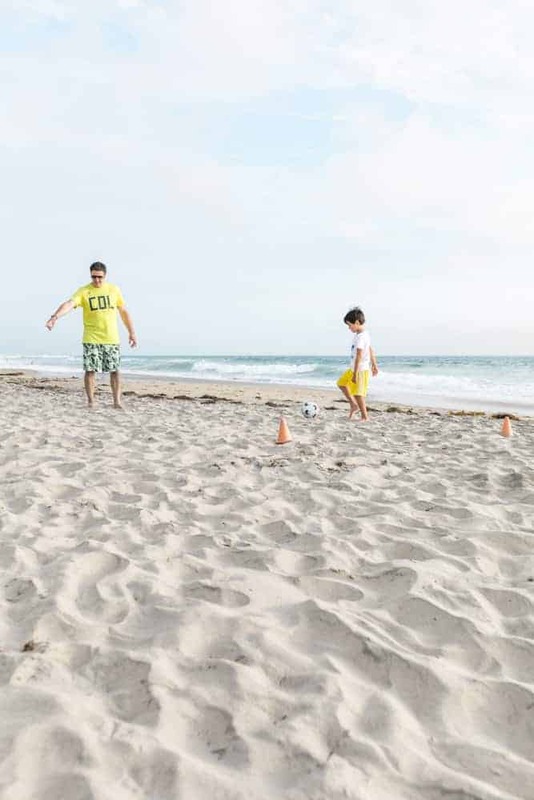 Soccer is a common bond between us and we’ve enjoyed making it a regular family even to go to the park and kick the ball around, and even better to hit up the beach for more of the same. With the World Cup going on the last couple of months there’s an amazing energy in the air. People are all rallying around their countries, and similar to the Olympics it’s awesome to see pride in country shine in something positive like a sporting event. We actually have fun mixing in some geography and history for our kids while watching the matchups, it’s a great opportunity to teach them a bit about the world while taking in the game. With the US not having a stellar 2018, my husband latched onto Colombia and Belgium. 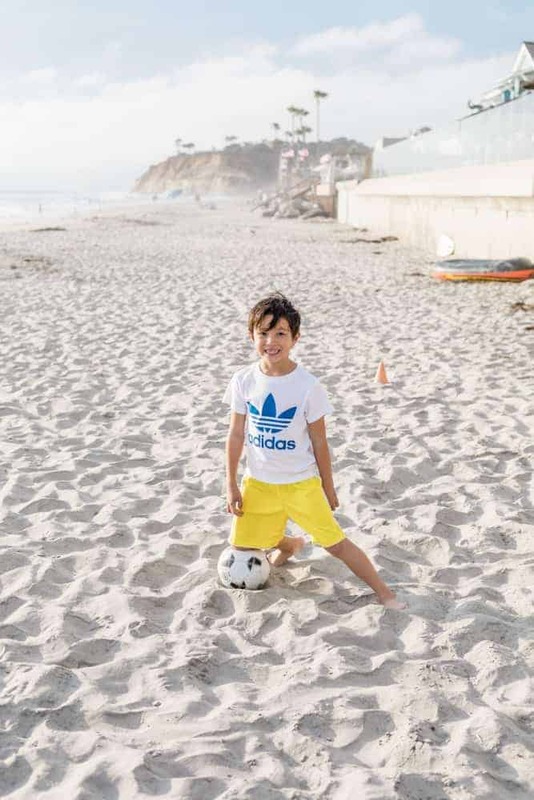 In these pics he’s sporting a World Cup Colombia shirt from adidas. I swear that half the reason he likes that team is because of their colors, but I can’t complain as I love how that shirt pops with the box lettering on bright yellow. Speaking of which the N.E.R.D. adidas shorts he’s sporting are also nice and loud… to be expected I guess as it’s part of the Pharrell Williams collection. My son’s adidas outfit might be my favorite with the timeless logo and the classic three stripe shorts. They are so light, definitely his favorite for playing sports. My daughter’s outfit shows off more design avenues of adidas, that shade of green on her shirt and pants are spectacular. 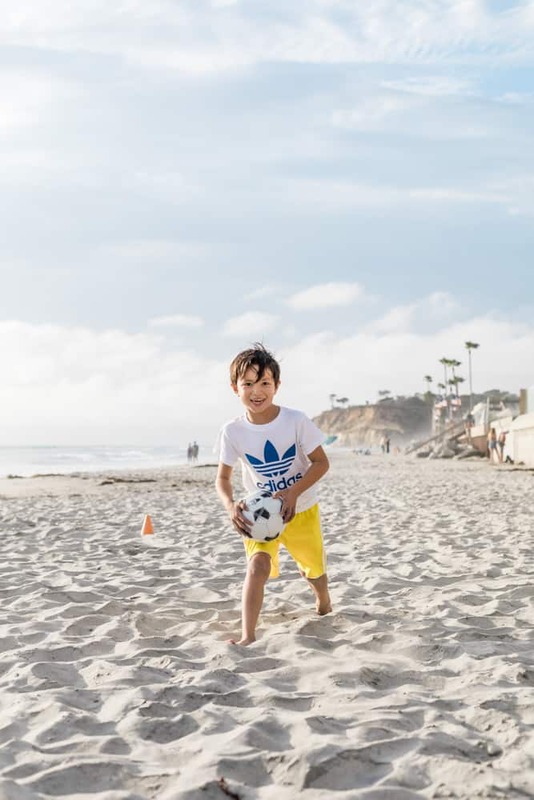 adidas has been synonymous with World Cup for the last month, and we definitely had fun at the beach that day in our adidas gear emulating Messi and Pogba during our penalty kick shootout. The beach provides a great setting to take up all sorts of sports, from surfing to stand-up paddle boarding, scuba diving to spearfishing. 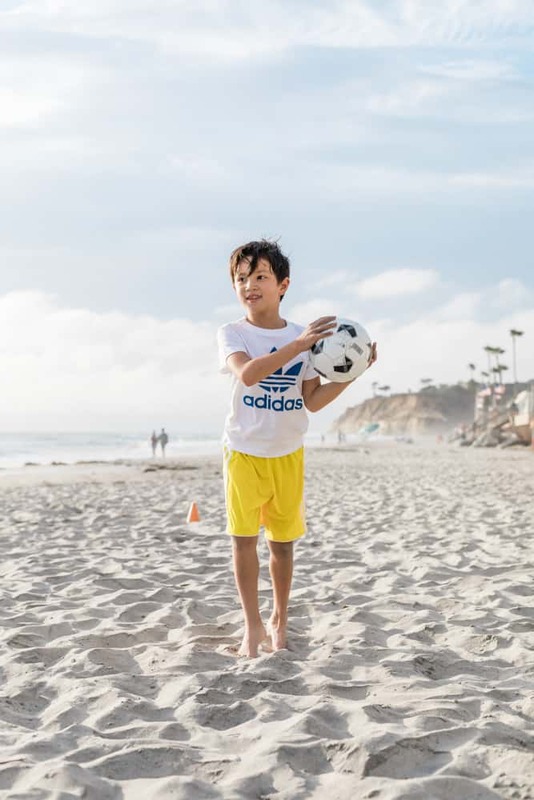 While we enjoy dabbling in adventure sports you’re more likely to see us playing a more traditional sport on the sand, our favorite being soccer. 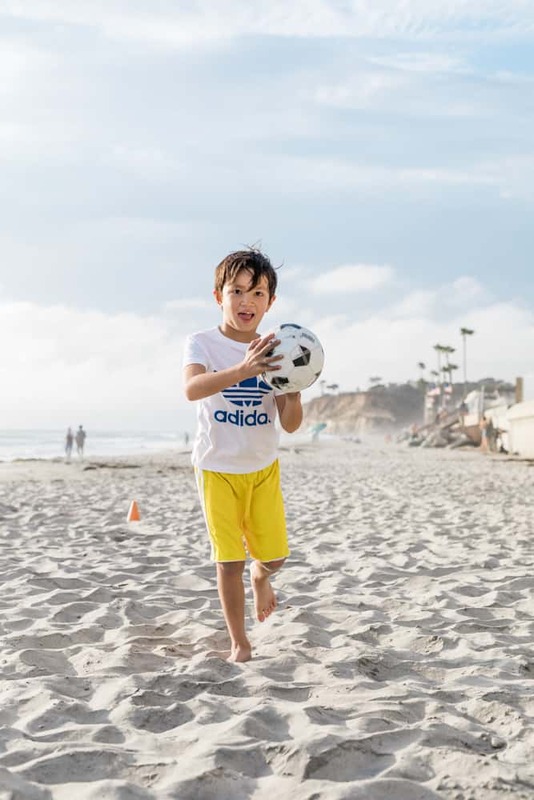 Running in the sand builds up different muscles than running on a hard surface so that’s a plus, and we play in the softer sand area where you can dive for the ball and not have bumps and bruises afterwards like other surfaces. 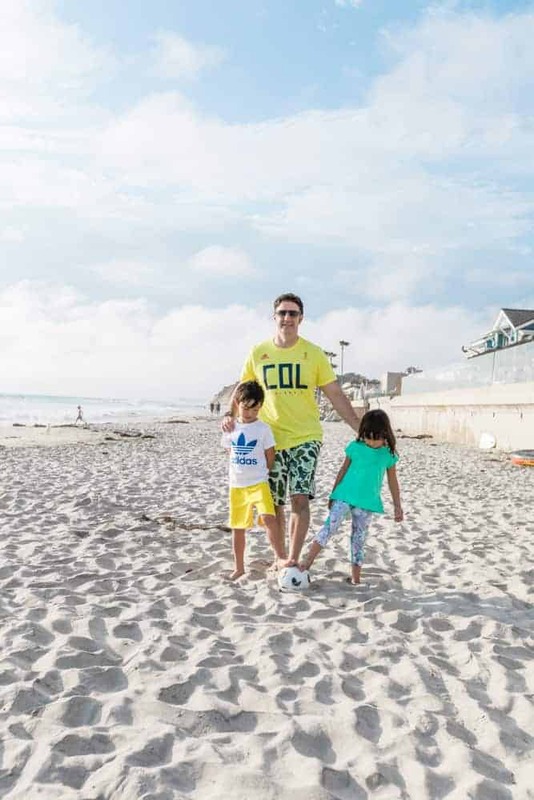 Soccer has been great for my family as it is something that both of my kids get excited about and can practice with each other even though they’re at different ages and levels. I sometimes see them in the backyard taking penalty kicks on each other or making up drills and games. For me that’s a trifecta of goodness: outdoors, athletics and my kids getting along together! 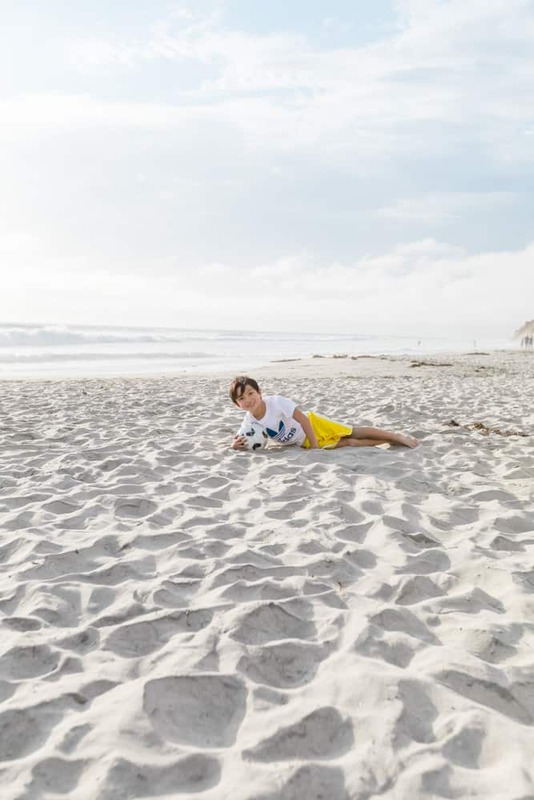 Nothing beats the beach and a ball. 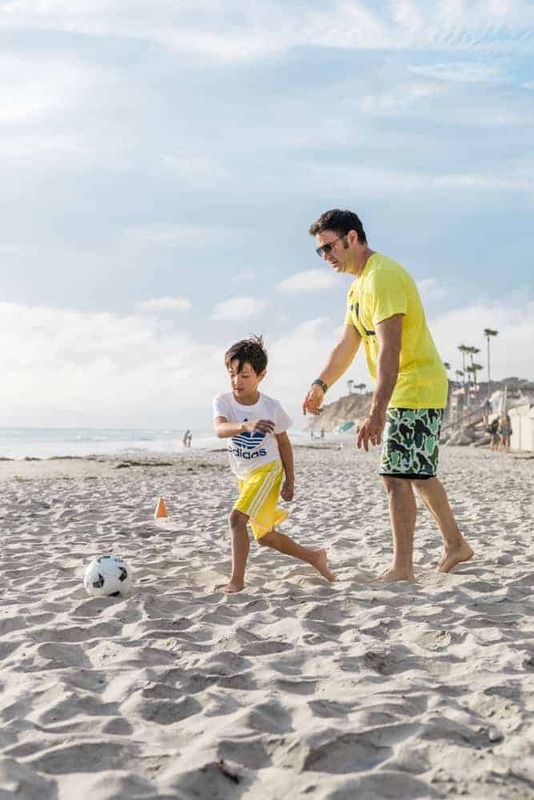 We love to get out on the sand with a soccer ball, volleyball, or even one of the old-fashioned giant beach balls. Wow, that beach is so beautiful and loving that white sands. 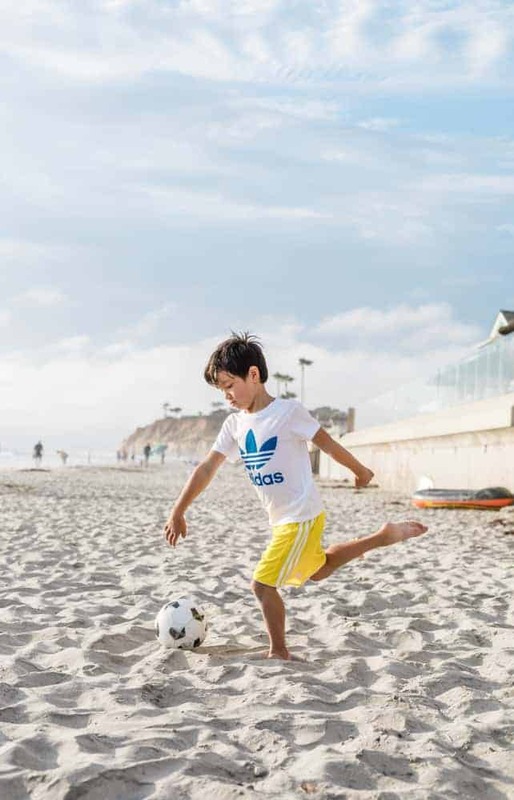 It looks like you will be having a great soccer player someday! My kiddos like playing soccer too. Those outfits look nice and something my kiddos would like wearing to the beach. I’ve been to San Diego once and loved it. I’m hoping to go back with my family so we can experience the city together. Looks like a fantastic day at the beach! Your photos are gorgeous! That looks like a really nice beach. I wish we had one like this around here. We don’t really have much for beaches, and they’re not this good looking at all. 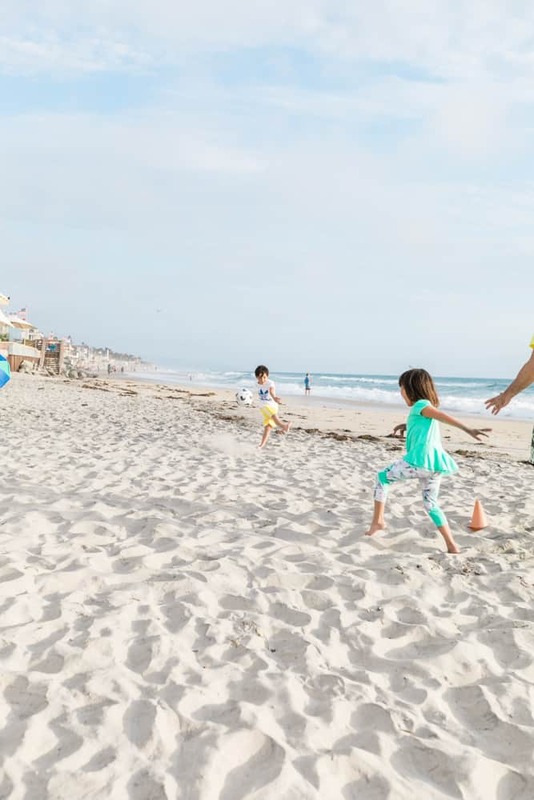 It looks like you and your family had a blast during your beach day! 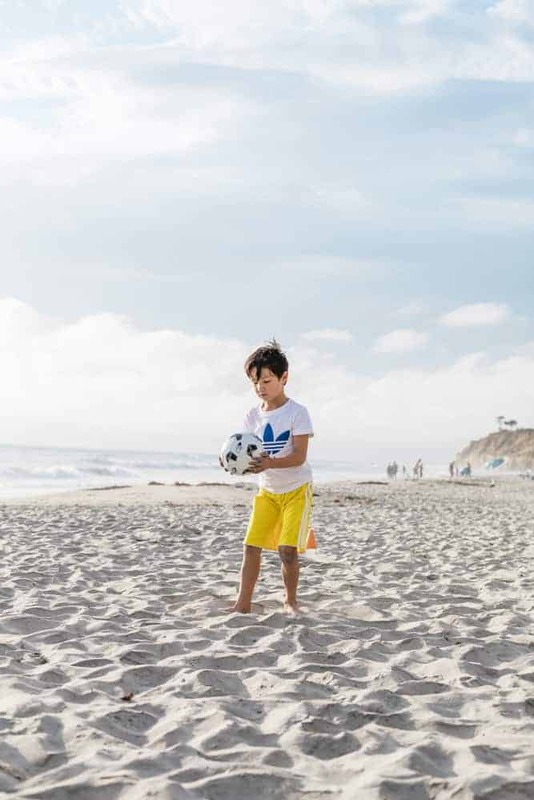 Our kids love to go to the beach too! We just need to make sure we have lots of sunscreen!